Can you imagine what would happen to your household budget if you could increase your income? Most personal budgeting articles, books and websites focus on just managing expenses. That's obviously a good thing, because personal budgeting is largely about controlling spending to spend less than you earn. You can't grow wealthy and/or financially stable any other way. But doesn't it make just as much sense to look at opportunities that allow you to increase your income? If you could increase your income, you'd supercharge your budget. Reducing expenses and then findg ways to increase your income by the same amount DOUBLES the effects of your cost-cutting. So, let's look at some ways you can increase your income without having to ask your boss for a raise! First, let's look at your tax situation. Are you getting a big refund each year? Yes? Then you're giving the U.S. government an interest-free loan every payday. Hmmmm...something tells me you'd rather not do that. "But I have big plans for my refund every year! ", you say. Well, that's a simple fix! Grab that money and save it each payday, earning interest in a savings account or money market mutual fund. Having less money withheld from your paycheck has another bonus: you have access to your money any time you like, instead of having to go through a laborious tax return process, not to mention waiting for the government to deliver the refund. How do you get that big refund back in your paycheck? All you have to do is go through the IRS's online withholding calculator, which you can find here. You'll need your most recent pay stub and tax returns handy. Or, you can simply download the IRS's W-4 form and worksheets in PDF format here. When you're done, print out your W-4 form or fill out a new one and bring it to your personnel department. Do you have a skill or service you can offer in exchange for skills or services? While it may seem as though bartering has a net zero effect on your budget, this isn't really true. You won't bring home any money, but you will reduce an expense (or more than one expense) if done effectively. Let me give you a real-life example. My daughters do tap and jazz dancing on a competitive basis. When you add up tuition, fees, costumes and miscellaneous expenses, it can get very, very pricey. So, I worked with the dance studio owner to develop a top-notch website (www.dance-evolution.com). I also filled a part-time front-desk position. Instead of getting paid for these services, I get money taken off my account. I'm going to be at the studio while my girls take classes. I might as well use that time to generate "income" that can be used to offset that expense! If you really need to pay down debt, save quickly for a specific goal or to build up a rainy day fund, or just want to increase your income by any amount, a part-time job can be just the ticket. However, you do want to maximize the extra hours you'll be spending on the clock. You want to leverage your work, which simply means you get the largest possible financial benefit from hours spent working. If you can get a $15 per hour job versus a $10 per hour job, which would you choose? You'll still be working the same number of hours, but you'll make a lot more with the first job. So, how do you leverage a part-time job? You can take one with higher pay, obviously, but there are other factors to consider. If you enjoy a fairly expensive hobby, such as golfing or skiing, why not take a part-time job in exchange for reduced or free rates? Granted, it's seasonal work, but it may be just the ticket for keeping those expenses out of your budget, with a job you actually enjoy. Same goes for working a retail job in a store where you frequently shop. Love to scrapbook? Find out whether the local craft store needs part-timers. Love clothes? Work at your favorite chain or boutique. I have a brother that supplemented his teacher's pay by teaching hunting and fishing classes at an outdoor sports store, year-round. He used his employee discount to support his own hobbies, made some extra cash, had a lot of fun, and met some nice people. Yes, you'll have to give up some leisure time, but the ability to increase your income may definitely be worth pursuing this strategy for the short-term. Having worked for myself for over 10 years now, I can safely say that this is probably one of the best ways to increase your income. You can take several tax deductions for a home business, especially if you set up the correct business format, which is usually an S-corp or limited liability company (LLC). What kind of home business should you start up? I've done direct retail (party plans), been a medical transcription and virtual assistant, offered consulting, and built content websites on various topics where I have passion or knowledge. Guess which type of business offers the most leverage? Content websites. Why? Because they can generate passive income, which means you can earn income while you aren't working, versus having to punch a clock. All the other forms of home businesses I've listed above have a direct relationship between hours worked and income earned. It doesn't mean you can't increase your income with those types of businesses; it just means your income is limited to your availability. What about selling hard goods? Sorry--I don't have the space, patience or time to manage an inventory, ship out goods, answer customer service e-mails and phone calls, and so on. A friend of mine who designed a product just for moms has had oodles of trouble getting suppliers that will do quality work at a reasonable cost. However, if you set up simple websites and fill them with useful articles, photos or tips on subjects near and dear to your heart, you build a passive business that you enjoy, that grows with time, and helps increase income while you sleep. The best tool I've found for learning how to build content websites from start to finish is SiteBuildIt!. I've personally used it to build six websites (some for clients, some for myself) since March of 2003. SBI! is a training course, website builder, and website marketing system, all wrapped up into one useful package. For a little less than $30 a month you can start a home business that's completely home-based, and completely computer-based. Want proof it works? Click here. They explain it better than I can. And if you don't know anything about building websites, don't worry. SBI! is designed for people like you. There's a written (or video)Action Guide that teaches you everything you need to know. It's very detailed, yet fun and easy-to-follow. I didn't know anything about building websites when I started using SBI!. So...don't let that stop you! In fact, regardless of which type of home business you set up, you can't let anything stop you. For a lot of folks, being self-employed and running a business is a bit out of their comfort zone. 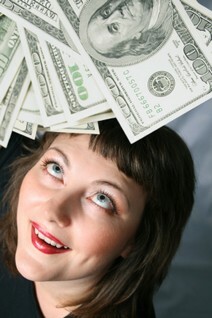 Stay focused on your goals: extra income! Here are some videos of real-life folks that have used SBI! to generate a little (or a lot) of extra income. If you already have a WordPress blog, but can't seem to drive enough traffic to generate online income, give SBI! 's bizXpress a try. I hope you've found some of these ways to increase your income helpful! Go here to listen to an interview I did with Money Matters Radio explaining how I "make money being online". I talk a bit about SiteBuildIt!, but also touch on all my experiences working from home over the last 11 years.